In Anishinaabemowin, eastern white cedar is sometimes called Giizhik, and also gi’jikan’dug meaning cedar like, as it’s not a “true cedar”. 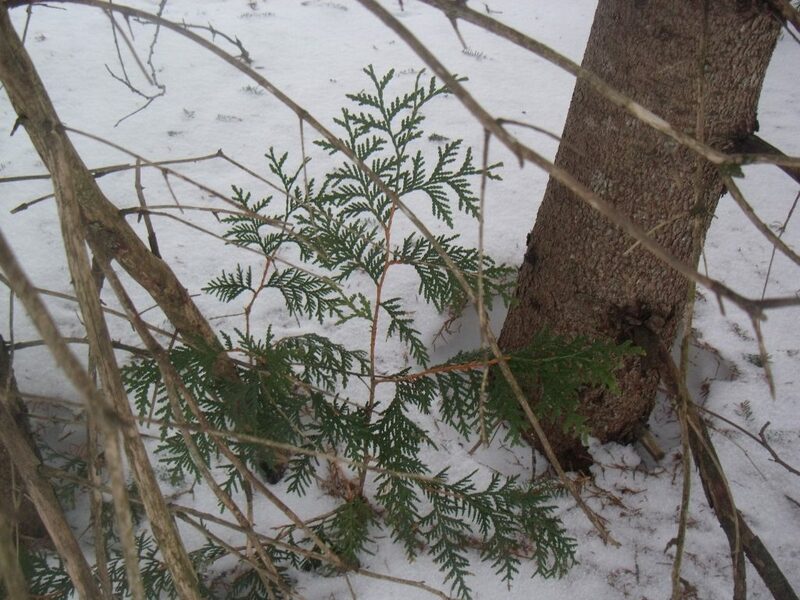 One of the alternative names for Eastern white cedar is swamp cedar as it likes to grow in damp woods. Another name is Tree of Life, which the white-tailed deer and a multitude of wild ones would wholeheartedly agree with. The white-tailed deer favor it for food and shelter. This young one could live for another 300 years, or perhaps more than quadruple that! The inner bark can be collected in spring and eaten fresh or dried to use as a flour. However, inner bark is typically a starvation food source. The needles and bark can be used to make a tea rich in vitamin C, like many of our local conifer trees, but skim off any oils that float to the top (See Warnings below). There’s a story here in Canada that back in the day Jacques Cartier cured his crew of scurvy with a white cedar tea under the herbal tutelage of the Mi’kmaq (pronounced “meeg mah”) First Nation. The leaves are not only rich in vitamin C, but calcium too! Medicinal tags include Antimicrobial and Diuretic. See Medicinal tag key for more information. Common uses include preventing scurvy and cough medicine. My personal favorite use is as cleansing bathing water. (Link is to Creators Garden explaining this usage as a strong lymphatic system medicine. Creators Garden is one of my favorite herbal medicine bloggers, and he’s nearby!) I boil the leaves on my woodstove in the wintertime, which in and of itself is lovely, but then I use the hot cedar water to wash up. Leaves and inner bark make dyes. I haven’t used them yet, so if anyone knows the resulting colors please comment! Thanks! The boughs make handy brooms that also deodorize a house with their cedar fragrance. There are multiple uses inside the home. Outside the home, it’s often been utilized for fencing as it’s resistant to rot (which is also why it’s been used in the making of canoes and longhouses). The outer bark of eastern white cedar can be used for weaving. They are slow growers that prefer damp areas and limestone-rich soil. If you want to plant them, typically as hedges or windbreaks, be sure to plant them at least 6 feet apart as they will, slowly, get quite large and the roots will need that space to thrive. Cedar oil is toxic at 120mg and can cause extreme low blood pressure, convulsions and death.